When it comes to working in esports, sometimes you take a roundabout method into the role you end up in. 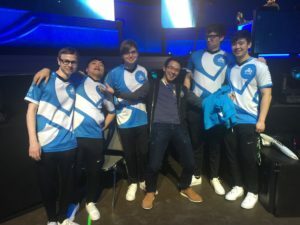 For the London Spitfire’s general manager Seunghwan “Robin” Lee, it was looking for a job after college and stumbling into a translator role with Twitch. Our Amanda Stevens spoke with Robin about how he got to the role he has today as well as the how he keeps the Overwatch League team’s synergy high and connect the players with the fan base. Are there any trials as a manager when you’re trying to connect a fan base and a player roster that have different backgrounds? You know, I thought that might be the case but it turned out it really didn’t matter at the end of the day. The fans over in London and the UK in general have been super, super supportive of us. I don’t know if you’ve seen, but when we did the Gilded Gala stuff and visited London, we had a wonderful time. Everyone was super supportive, a lot of people showed up. I guess in a sense, especially when I had to do all the subtitles for all of our videos, that was a painful time. Apart from that, it’s not really that big of an issue, honestly. If at all, do you keep the players in touch and like to promote synergy even during the offseason? I assume that they all don’t live near each other in Korea. So our offseason was our true offseason where we didn’t do any bootcamping. Our longest visit was I think about five weeks. Over that course of time we didn’t really do anything special with the boys but they did hang out with each other all the time. Some of the boys had, you know, one bedroom apartments and other boys would come over because not all of them live in Seoul in Korea – some of them live pretty far south. So they would come up and hang out together. We didn’t have to do anything, it just naturally happened. Do you ever worry though, they spend so much time in a close proximity for a very long stretch of the year and then you send them to be scattered off to the winds. Do you ever worry that might disrupt the chemistry at all? Not really, just because when you’re a pro gamer you’re playing with your teammates for at least eight hours a day and you spend like sixteen hours a day with each other apart from the time you sleep. And even when you sleep, we have people sharing rooms. So I don’t really think that’s an issue. They just spend just so much of the season time together. What role, if any, do you have in helping the players acclimate to living in America? One of the first things I did back when we we’re also living in apartments and didn’t have a massive house like this, when the season began, we went down to K-town, bought Kimchi and ramen because that’s like THE essential food – the soul food for Koreans. If they don’t have Kimchi or ramen, it’s really hard for them to survive. Koreans are very very picky and sensitive about food – this is just generally true. So I just tried doing that kinda stuff. We also had players hang out together during the short off-season breaks – like last year we did a Catalina Island trip. Alright, so this is a fan question – They wanted to know what’s the most interesting question you ask a potential member of the team. Like, do you have any weird questions that you ask them to weed out or see how they’ll mesh? I don’t really know. They always talk about which K-Pop group they like the most or which member of a particular K-Pop group they like. One of the fans was like, “ah – I wonder what the screening process is like for players”. I mean, K-Pop is a great starting point. Since managers don’t really get a lot of the spotlight and you have a unique path than a lot of other people in your position – how did you get into esports and how did you translate that into becoming a translator and then getting into the current role you have now? After graduating college, I was in Korea, I was going to take a year or two off before going to graduate school and during that time, I didn’t really have much to do so I was just browsing, watching LCK League of Legends and what not and I saw a random Twitter job listing for translator. That’s how I got into esports – for OGN. And then I got connected with a bunch of people like Monty, Doa, Barrie, those kinds of – they connected me with Jack who was Bootcamping in Korea with the C9 League of Legends team and they were looking to hire a Korean coach and they needed a translator. That’s where I jumped in! Then they tried out Reaper and me together and the rest is history. Do you have any words for C9 supporters or London Spitfire supporters? There’s been a couple of times, especially when I was with the League of Legends teams, that there was a little bit of spotlight on me but I don’t really think that’s too necessary. For me, what’s important is the players get the attention and support necessary from the fans. I know that it can get tough for pros, especially when you know you’re not doing well on stage, you’re losing games or even if you win, your individual performance isn’t good then you can kinda feel down. So I would like to urge all our fans to send all the love to our players.